U.S. Naval Academy Superintendent Vice Adm. Ted Carter pins the Navy and Marine Corps Medal on Midshipman 3rd Class Jonathan Dennler's uniform. A U.S. Naval Academy midshipman from South Jersey received the highest non-combat award for his heroic actions during a Boy Scout trip in Canada. 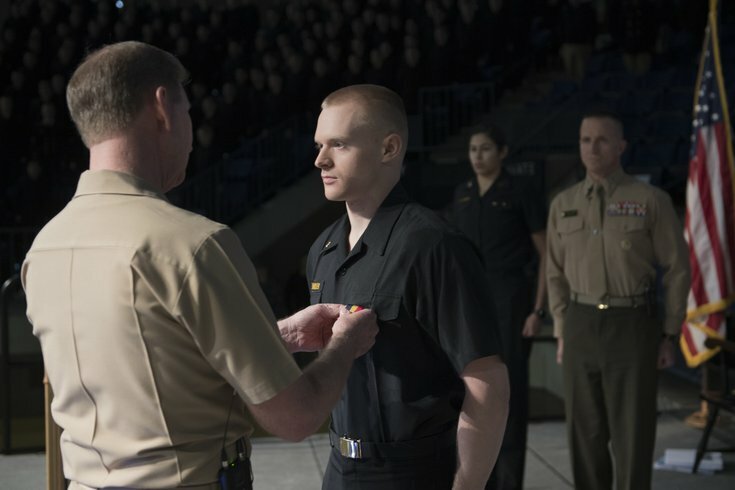 Midshipman 3rd Class Jonathan Dennler, from Medford, Burlington County, was decorated on Jan. 9 with the Navy and Marine Corps Medal by the U.S. Department of the Navy. "It was an incredibly humbling and unexpected experience," Dennler said of the incident. "I'm very thankful to everyone who helped to make that happen and for the support of my family and friends." Last July, Dennler was leading a Boy Scout troop on a camping trip to Quetico Provincial Park in Ontario. An overnight thunderstorm brought 80-mph wind gusts that caused two trees to fall on the campsite, injuring several people and killing an adult volunteer and a scout. Unable to contact help via the radio, Dennler canoed more than 1.5 miles with winds howling at 60 mph to a ranger station to bring back help and medical supplies. "USNA has taught me how to work and think in environments where many things are out of my control, and I think the academy helps to create mindsets that put others first," Dennler said. "I am incredibly thankful for those lessons." The award, which was first bestowed to President John F. Kennedy during World War II, is given to individuals whose heroic actions place them in life-threatening risk. Approximately 3,000 people have received the award. Dennler is majoring in political science and plans to serve in the Marine Corps after graduating in 2019.